The Praia da Dona Ana is one of the most picturesque beaches of the Algarve, and is a great location for your day on the beach. The Dona Ana beach is located to the south of Lagos and is situated within the limestone cliffs of the Ponta da Piedade headland. This is a beautiful natural setting; the highly eroded cliffs reveal layers of golden strata, the calm sea waters are an idyllic turquoise colour, and the sands are soft and inviting. Along with the wonderful scenery, there are are all the expected facilities of a popular beach, including beach restaurants, shops and showers! As a beach destination, the Praia da Dona Ana is ideal for spending a relaxing day on the beach, as there is a calm ambience and the setting is stunning. 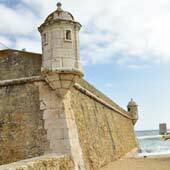 The beach is suitable for families, having clean and calm sea waters, while on blustery days the high cliffs provide shelter from sea breezes. 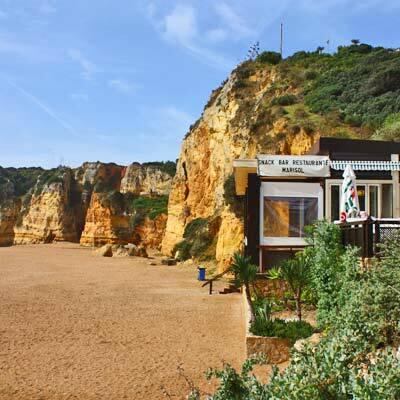 It is possible to walk to the Praia da Dona Ana from the historic centre of Lagos (about 20minutes), but the beach is also served the tourist-road train and a local bus route (“A Onda” bus; Linha 2 - blue route). 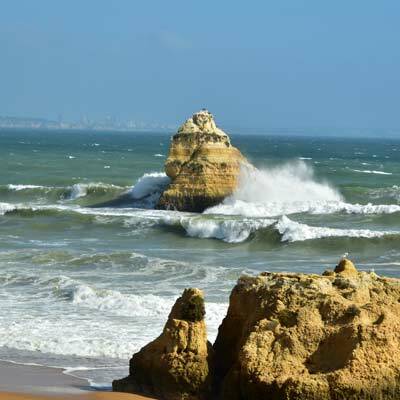 This article will provide an introduction to the Praia da Dona Ana, one of our favourite beaches of the western Algarve. 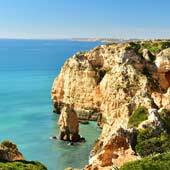 The Praia da Dona Ana (GPS: 37.091427, -8.669362) is located 1.8km to the south of central Lagos and is between the Praia do Pinhão and Praia do Camilo. The beach was greatly extended in 2016 (much to the disgust of locals) and is now the largest beach along the Ponta da Piedade coastline, with a shoreline of 300m and a depth of 70m. The Praia da Dona Ana is a calm and relaxing beach, which is ideal for a day of sunbathing, with cooling breaks in the sea waters (which is always cold). This is not a beach for energic activities (surfing, kite surfing), does not attract rowdy visitors (groups, excessive drinking, loud music) and is free from banana boats, jet skis and speed boats. The beach is accessed via two different set of steps, which lead down the cliff face, and this makes the beach unsuitable for visitors who have mobility issues. On the beach, deck chairs, parasols and sunshades can be hired for €15 per day, and there is the “Marisol” beach restaurant for light meals. For better value refreshments there is a shop at the top of the cliffs, near the car-park (GPS 37.091499, -8.670237). 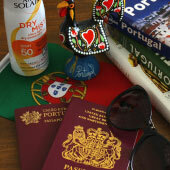 The Praia da Dona Ana is a dog free beach (May to October) and it is illegal to camp or have BBQs on the beach. Advice: The Praia da Dona Ana gets very busy in the summer. 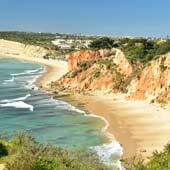 If you are after an alternative beautiful beach, consider visiting the Praia do Camilo, or if you just want a good beach for the day head to the Praia de Porto de Mós or the Meia Praia. 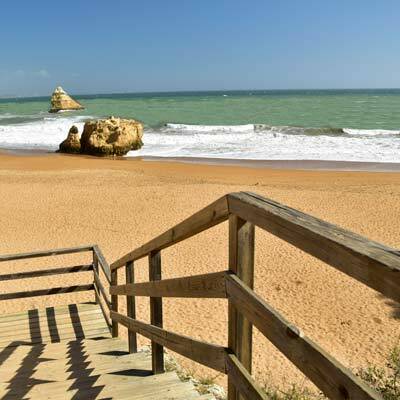 The Praia da Dona Ana beach is a good beach for families with young children, and is popular with Portuguese families. The Ponta da Piedade shelters the beach from the powerful Atlantic Ocean waves and there are no strong currents or tides. During the summer the beach is lifeguard supervised. The Dona Ana beach is easily accessible from Lagos, only being 1.8km from central Lagos. There is limited car parking at the beach (approximately 70 spaces) at the top of the cliffs, but this fills up quickly in the summer and is shared with nearby hotels and holiday apartments. The walk from Lagos to the Praia da Dona Ana takes less than 30 minutes. 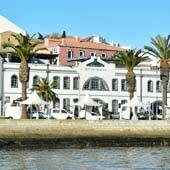 The route follows the main harbour road (Avenue dos Descobrimentos) south from Lagos. At the fire station (GPS: 37.095586, -8.670128) turn left, walk up the hill and around the edge of the Iberlagos apartments, and you’ll find the coastal path and the entrance to the beach (GPS: 37.092790, -8.669152). The unique rock formations are carved out by the savage winter storms – in the summer the seas are calm! 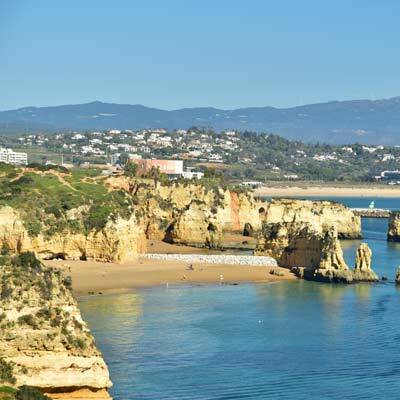 Inside info: The Linha 2 is useful for a beach holiday to Lagos, as it connects the city to the Meia Praia, the Praia de Porto de Mós and the Praia da Dona Ana. Lucky you! 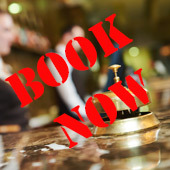 This is a good location for a holiday to Lagos as it is within walking distance of the city centre (about 20 minutes), but far enough out to avoid the summertime pandemonium. 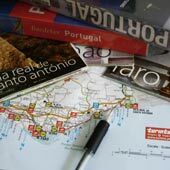 There is a selection of good restaurants close by; Onda Norte, Restaurante Paraíso, and Pizzeria Gato Pardo, and of course, there are the beaches (Praia Dona Ana, Praia do Camilo and Praia do Pinhão). The only slight issue (more and eye-sore) is the derelict Golfinho hotel, which is an ugly reminder of 1970s hotels.